Барааны дугаар Байхгүй. Categories: CAMBRIDGE, International Examinations | English Resours. 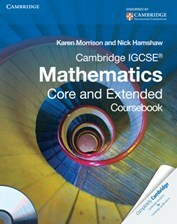 This highly illustrated coursebook has been written by an experienced author and an IGCSE Maths teacher to cover the complete Cambridge IGCSE Mathematics (0580) syllabus. Core and Extended material is combined in one book, offering a one-stop-shop for all students whatever their capabilities. The extended material is clearly marked, and useful hints are included in the margins for Core students needing more support, leaving the narrative clear and to the point. Students doing the Extended course are given access to the parts of the Core syllabus that they need without having to use an additional book. Answers to book exercises and exam questions are at the back of the book, with additional exercises and interactive questions on the CD-ROM. The coursebook will be accompanied by two Practice Books – one each for Core and Extended – to offer targeted practice.